-Conveniently docks one set of Apple AirPods and Apple Watch Series and iPhone, say goodbye to the endless tangle of cords. Specially support Apple watch night stand mode. 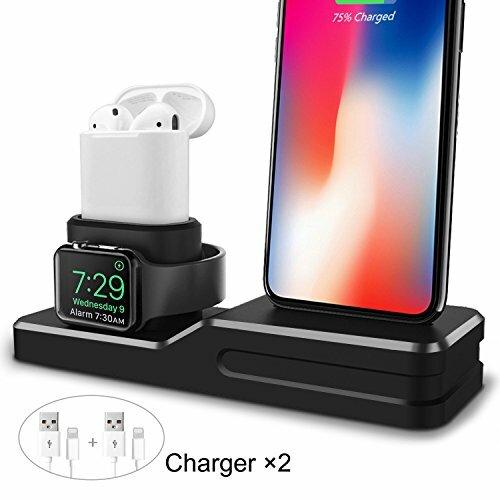 -Charge your Apple watch,iPhone, and Airpods at the same time at the same place, good organizer for your device, providing a neat desktop. -Made of premium silicone material with soft finish, comfortable to touch and enables to charge your apple accessories steadily and neatly. -Push the charger wire and pull through, easily to install. -Tight fit to make sure your charging cable stays in place and prevent the charging plug pushing down each time. -The apple charging station provides a comfortable viewing angle and quick accessibility to all devices. -Perfect for your Apple Watch Series 1/ Series 2/ Series 3 (38 mm and 42 mm)/ Nike+/ Sport/ Edition; Apple AirPods, iPhone 8/ 8 Plus, iPhone X, iPhone 7/ 7 Plus, iPhone 6/ 6s Plus, iPhone SE/ 5s/ 5c, etc. 1)Compatible with Cables We Provided or Apple Original Lightning Cable ONLY. 2)Watch Charger and Devices are NOT included. 3)Push the iPhone series charging cable strongly from the bottom of the stand into the hole in order to better fix the cable and make it difficult to move when charging. 4)Before charging the iPhone/ airpods with case, the cable tip edge should be higher than the edge of the hole. If you have any questions about this product by ODELENWA, contact us by completing and submitting the form below. If you are looking for a specif part number, please include it with your message.